A Lake Erie algae bloom in September 2009. This photo was taken on the southeast shore of Pelee Island, Ontario. Photo: Tom Archer. Lake Erie faces a greener future–and that’s bad. Scientists say harmful algal blooms like the one from 2011 will strike more often. More extreme weather and warming trends could also extend bad blooms’ duration. As a result, Lake Erie’s aquatic life and wildlife in nearshore areas face more frequent exposure to toxins. Food webs face disruption. Fisheries will suffer. Lake Erie’s persistent dead zone will expand. And water chemistry will change. The reason is that all trends that caused Lake Erie’s 2011 algal bloom show signs of continuing. 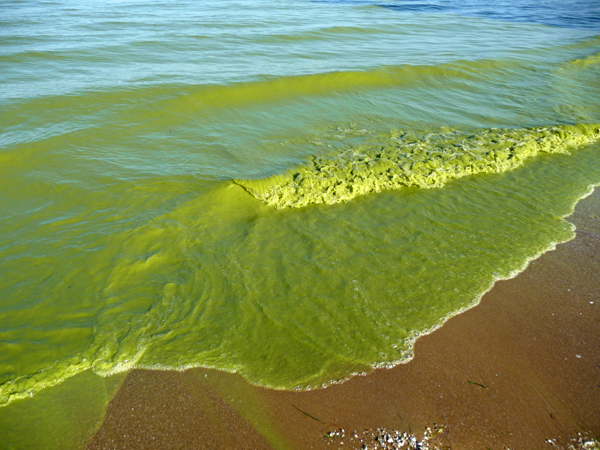 From mid-July through October that year, bright green scum covered the western third of Lake Erie. Climate change, farming practices, land use, and invasive species all combined to produce that record-setting event. “The 2011 bloom was a catastrophe. But it could become the new normal if we don’t do anything,” says ecologist Thomas Bridgeman at the University of Toledo. Bridgeman and 28 other scientists report their findings this month in Proceedings of the National Academy of Sciences. “It’s not that there’s a particular year after which I can tell you we expect these all the time,” says ecologist Anna Michalak at the Carnegie Institution for Science. Indeed, a long drought made 2012’s algae bloom forecast much milder. 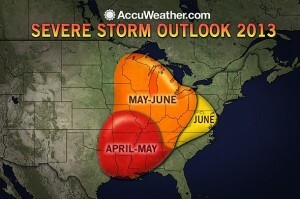 Nonetheless, says Michalak, “Every year would be more conducive to blooms than the previous year.” For 2013, AccuWeather’s long-range forecasters predict May and June will bring an active severe storm season for most Great Lakes states. Heavy spring rains in 2011 washed large amounts of phosphorus-rich fertilizer into Lake Erie. Then summer brought warm temperatures and calm waters. Cyanobacteria, also called blue-green algae, multiplied out of control. Cyanobacteria can be toxic. For example, Microcystis produces a liver poison. “When we estimated the concentrations of these toxins in the top layer of the water, it was up to about 200-fold of the World Health Organization standard,” says Michalak. People generally don’t drink those top levels of lake water. Nonetheless, filtering the bacteria out of drinking water can cost thousands of dollars in extra water treatment. Beach postings and public health advisories limit people’s swimming exposure. In contrast, fish and zooplankton are likely to eat cyanobacteria. Toxins’ chronic effects on the liver or nervous system can weaken their populations. Birds and shore-dwelling mammals could also eat toxin or inhale it in aerosols. “When it gets into the respiratory system, it’s incredibly toxic,” says marine biologist Michael Carvan at the University of Wisconsin — Milwaukee, who did not work on the study. While some animals might go elsewhere, it’s unclear whether they do. “Not all of the blooms produce toxins equally,” notes limnologist Thomas Johengen, at the University of Michigan and the NOAA-Great Lakes Environmental Research Laboratory. Carvan concurs. 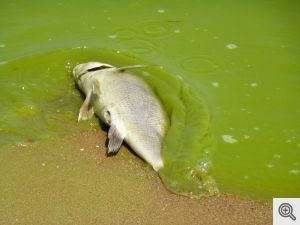 Lake Erie’s fisheries suffered in the record-setting 2011 algae bloom, as seen in this photo, taken in August of that year on Pelee Island, Ontario. Photo: Tom Archer. Nonetheless, cyanobacteria disrupt the food web. “It’s not good food,” stresses Johengen. Cyanobacteria provide poor nutrition for the food web’s lower feeding levels. Consequently, Lake Erie’s rich fisheries can suffer. Bad blooms bring more problems when they die. Rotting clumps on shore provide breeding grounds for other harmful bacteria. In the water, decaying bacteria lower dissolved oxygen levels. The worst cases lead to so-called dead zones, or hypoxic zones. Lake Erie already has a persistent dead zone in its deep, central waters. 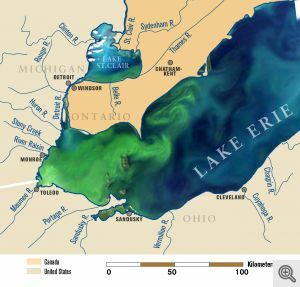 Earlier this year, Johengen, Michalak, and others reported that Lake Erie’s dead zone has been getting bigger since the mid-1990s. Bad algal blooms will aggravate the problem. “That’s a larger area of the lake that is rendered unusable by fish for a longer period of time when they need to be feeding as much as possible so that they can grow and reproduce,” notes Bridgeman. Fish like yellow perch could particularly suffer. Dead zone water chemistry could also cause sediments to release stored toxins, such as mercury. Meanwhile, phosphorus and other nutrients stay in the lake. Even if they sink into sediments, storms can churn them up to feed future blooms. “It’s kind of a downward spiral,” says Bridgeman. A satellite image of Lake Erie on Sept. 3, 2011, overlaid on a map of the lake and its tributaries. This image shows the bloom about six weeks after its initiation in the lake’s western basin. On this date, it covers the entire western basin and is beginning to expand into the central basin. Photo: Michigan Sea Grant. Climate change models predict more extreme weather. More heavy spring storms will likely wash more phosphorus-rich fertilizer off farmland. Wind patterns during long summer dry spells will promote cyanobacteria growth. And general warming could start algal blooms earlier each year. Farming will continue around Lake Erie, especially in the Maumee River basin. Biofuel markets encourage growing more corn, which uses more fertilizer than other crops. Meanwhile, fall fertilizer regimes, surface fertilizer applications, and no-till practices leave more nutrients sitting on soils where rains can wash them away. Ideally, Michalak says, more prudent practices could save farmers money while reducing nutrient loads. Invasive quagga and zebra mussels make matters worse. Their filter feeding removes competing, beneficial algae and lets more sunlight reach lower depths. Then mussels release phosphates and ammonia, which further fuel blooms. the use of aeration is a proven method of dealing with toxic blooms.